“Frozen” fans, we have great news. The characters from the popular movie have arrived at Walt Disney World. Here’s where you can get your Frozen fun at Walt Disney World. 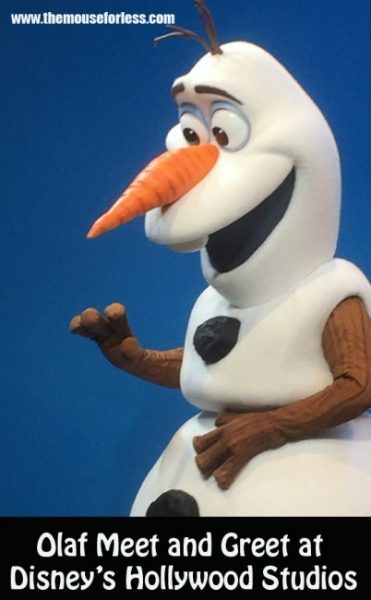 Guests can now meet their favorite snowman, Olaf the Echo Lake district at Disney’s Hollywood Studios is the all-new Celebrity Spotlight. Olaf is living his dream “In Summer,” chilling on the beach and ready with warm hugs for all his friends. 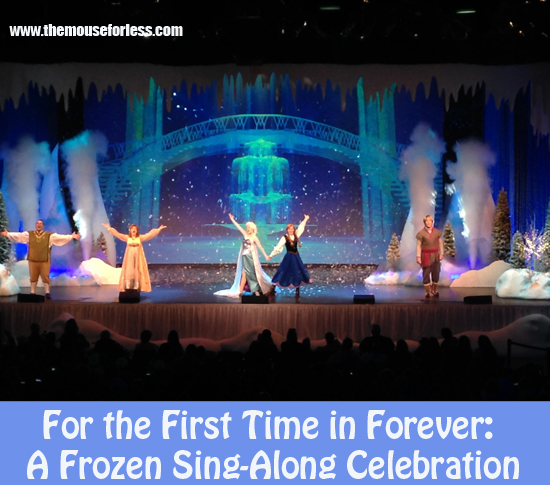 “For the First Time in Forever: A Frozen Sing-Along Celebration” is a hilarious and interactive presentation of the Frozen story. The show is presented in the Premiere Theater on Streets of America and there are multiple showings (up to 10) per day. FastPass+ is available for this experience. The new Frozen Ever After attraction in the Norway Pavilion immerses guests in their favorite movie and make them feel as though they have been transported to Arendelle. Frozen Ever After takes Guests on a journey to see Anna, Elsa, Olaf, Kristoff, and all your other favorite Frozen characters. 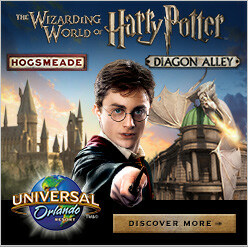 FastPass+ is available for this experience. Anna and Elsa are now found in the Norway Pavilion at Epcot at the Royal Sommerhaus. 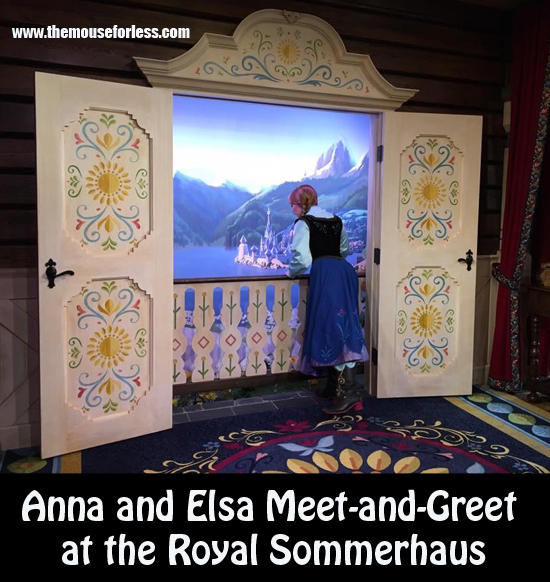 At the Royal Sommerhaus, Guests are able to enter Anna and Elsa’s family summer home, nestled in the countryside where you’ll find a charming cabin and a welcome from Queen Elsa and Princess Anna. Pose for a photo and share a warm embrace with the sisters. During the Disney Festival of Fantasy, Celebrate the Disney stories you love with a magical mix of floats, costumes and original music. Anna and Elsa are a part of the celebration alongside Mickey, Minnie, Rapunzel, Cinderella, Peter Pan, Ariel and more. This all-new, live stage show is a celebration where Mickey and friends have ventured far and wide to gather Disney pals from all over to star in a royal friendship faire. Goofy has invited Tiana and friends from the Land of the Bewitching Bayous to infuse New Orleans jazz in the party. Donald Duck brings some new friends he met at the Snuggly Duckling and Daisy has asked Rapunzel and Flynn to sing along. Mickey recruited Olaf, Anna and Elsa from the Land of the Mystic Mountains! Mickey’s Royal Friendship Faire culminates in the joining of classic and contemporary Disney Characters in a spectacular show featuring lively dancing, dazzling effects, an original song and memorable music from The Princess and the Frog, Tangled and Frozen. Show off your love of either Elsa or Anna with a special package that is available at the Bibbidi Bobbidi Boutique. 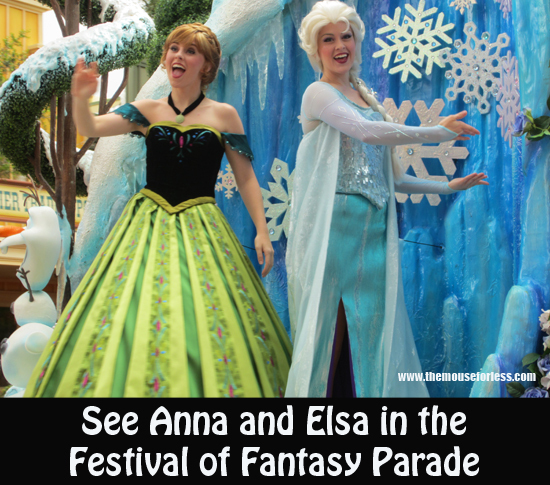 Guests will be able to choose between the Anna hair-styling with costume or Elsa hair-styling with costume. Guests will also receive shimmering makeup, face gem, nail polish, a Princess sash, a Princess cinch bag, and a huggable 12-inch Olaf plush. Guests visiting Walt Disney World will be able to experience this transformation at either the World of Disney at Disney Springs or inside Cinderella Castle at the Magic Kingdom, however, note that separate theme park admission is required for the Magic Kingdom Park location. 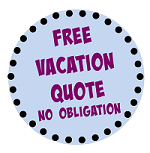 To schedule an appointment, call 407-WDW-STYLE.